"Our Port is a gemstone waiting to be cut and polished." As we strive to develop the port of Sydney as a marine services, container and logistics center, our prospects are good. Our marine services strategy is already unfolding and will have a profound effect on Sydney and its harbor in the years ahead. There are some of course who think we will fail. Worse still, there a few who want us to fail. How Cape Breton could possibly benefit from this failure is beyond me...all it would mean is less opportunity, more unemployment and more despair. With the West slowing, the lifeline of money from northern Alberta is beginning to dry up. We must look to develop what we have, especially our wonderful port. If we can integrate our port into the larger global economy, we will never look back. Our port is a gemstone waiting to be cut and polished. 2. Port of Sydney marketer asks public to "cut us a little slack"
Re: “Port expert says container terminal unlikely for Sydney,” (Oct. 20 story). I was astonished by the claims of a provincial government consultant, Mr. Neil MacNeil, that Nova Scotia’s ports face poor prospects. While I recognize Mr. MacNeil’s experience in government, and understand the challenges we face in developing our maritime facilities, I thoroughly disagree with his assessment of the marketplace. The tone of his interview unfortunately reflected many of the self-destructive patterns so painfully described in the Ivany report. Mr. MacNeil has the right to be a naysayer, but it would help to get the facts straight. For example, he uses 2008 as a baseline. Everyone knows 2008 marked the nadir of the greatest financial crash of our lifetime. Stock markets plunged and so did trade and shipping. It’s a miscalculation to make projections about 2018-2020 based on what happened in 2008-2010. The recovery from 2008 has been painfully slow and protracted, but it is underway. Contrary to the article, global trade is not shrinking, but growing. This year, trade will grow in the three to four per cent range — hardly robust but certainly respectable. Based on Drewry Maritime Research, global container traffic will grow 5.7 per cent in 2014, up from 4.7 per cent in 2013, reaching 684 million units (TEUs) by the end of 2014. It is expected to grow again in 2015. Virtually every economic scenario, even those forecasting weak global expansion, see growth in container traffic through 2020. The new super-sized ships being built are more economical, but harder to berth. Nova Scotia harbours at the cities of Halifax and Sydney have the depth to handle these vessels, along with Norfolk, Va., and Baltimore, Md. Harbours along the east coast like Savannah, New Jersey and Boston, are undertaking aggressive dredging programs, but most are still hampered by bridges. Construction giant Bechtel has proposed building an artificial island to provide a “hub” where these super-ships can transfer containers to smaller vessels. This project would cost billions of dollars. Do you suppose Bechtel would be proposing this scale of investment if it thought there would be no vessels to use it? Mr. MacNeil implies that no one is investing in new harbour and port facilities to handle container traffic or other cargo and he cites Montreal. Large investments are indeed being made in the Port of Montreal. The port of Prince Rupert, B.C., which many thought a pipe dream 15 years ago, continues to attract both investment and traffic: 500,000 containers last year. On the East Coast, billions are being spent in Savannah, Jacksonville, Norfolk and New York-New Jersey, all in anticipation of larger container ships. In Europe, Southampton is investing heavily in larger cranes and Rotterdam is investing billions to ease congestion caused by larger container ships. Other ports making significant investments include Hamburg, Antwerp and Liege. Dubai, a port many thought impossible 25 years ago, continues to grow and invest in its future. Dubai’s chief rival, the Port of Singapore, is investing billions in new facilities focused on container traffic. The list goes on and on. How did Mr. MacNeil miss all this? There is plenty of investment taking place around the world in anticipation of greater container traffic travelling on fewer but larger ships. The only question is: will Canada, Nova Scotia and Cape Breton participate in this investment? Will we throw our hat into the ring or simply allow the benefits of our new free trade agreement with Europe (CETA) to be enjoyed in Norfolk or New York? Sydney has one of the finest, most strategically located harbours in the world. It is close to the St. Lawrence Seaway, the developing Northwest Passage and is the first stop on the great circle route from Europe or Suez. It is deep enough for these super-ships and they can get here faster and cheaper than any other harbour on the East Coast. If Sydney’s all-in intermodal costs can be proved competitive, or even a touch cheaper, then we have the makings of a super-harbour. As for the investment money, it is out there waiting for us to get our act together. It’s time for Nova Scotia to stop getting in its own way. Note: To access a March 10, 2015 interview with Barry Sheehy conducted by CBC/Radio-Canada entitled “Barry Sheehy – Sydney Port Development,” refer to the following link. SYDNEY — Barry Sheehy is asking people to try to put aside any natural skepticism about potential port development as he and his partner try to round up business for the port of Sydney. As Harbour Port Development Partners, business consultants Sheehy and Albert Barbusci have together spent more than $1 million of their own money in the past 18 months to market the port for development. “We’re both experienced businessmen, we wouldn’t have invested this time and energy and resources if we didn’t think this had a very good chance of ultimately working,” Sheehy said. The partners “fully expect” to make money at the back end of development, he added, and believe enough in its potential that they are prepared to take the risk at the beginning. Cape Breton Regional Municipality council will be asked to approve a deal that will give the duo the exclusive right to continue those efforts for the next two years. When they do go abroad and say they have support, those contacts will check if that’s the case. The community has to lose the attitude that nothing will happen, or that the development must be guaranteed before offering its support, Sheehy said. “One can’t guarantee anything except our earnest efforts and hard work,” he said. Sheehy said he can understand some of the skepticism based on past events, and he would tend to agree that not enough has happened, given the port’s potential. A native of Montreal, Sheehy lived abroad for two decades before settling in Gabarus about seven years ago. After hearing a briefing on the port from Mayor Cecil Clarke, Sheehy said it became clear people he knew would probably have an interest in the port. “This was a bit of a diamond in the rough and it just needed the right people brought to the table,” he said. He believes Sydney represents the most valuable piece of maritime real estate on the East Coast, and said he has no difficulty getting others to see that potential, even in its undeveloped state. After taking some time to get familiar with the file, he and Barbusci began reaching out to contacts and potential partners, including financial operators and investment bankers, starting in Canada and then branching out to Asia and the Middle East. From there, they began contacting port operators, shippers and logistics operators, and started visiting them. Those trips took them everywhere from New York and New Jersey, to Tokyo and Beijing. “The next round of trips will take us to Suez, Egypt, and to Israel, where there’s a lot of interesting port activity going on,” Sheehy said. They are also working to set up potential sister port relationships. The bill for all of that effort has been footed by Sheehy and Barbusci. “It doesn’t take long to run up a big bill because we have attorneys involved, we have graphic artists involved, cartographers, maritime experts, rail experts — that all costs money — and then travelling is incredibly expensive,” Sheehy said. The exclusivity agreement is needed so they can demonstrate going forward that they have the mandate to speak with parties on behalf of the port, he added. “We’ve operated largely on good faith, on the assumption that a contract would be forthcoming when we needed it,” Sheehy said. With the move to larger and larger ships, the timing for Sydney is good, he said. Rail will be key, and Sheehy said they have had good discussions with CN and others about the rail link. Sydney’s advantages include its location, a silt harbour bottom, lack of overhead obstructions and no legacy problems, Sheehy said. When discussing the Atlantic Gateway, everyone’s focus is typically on the Maritime Provinces, but Quebec, in a practical sense, is very much an Atlantic Province. Quebec’s Atlantic shoreline along the Gulf of St Lawrence and the Gaspe is enormous. The Port of Montreal, located a thousand miles inland on the mighty St Lawrence River, is the most successful inland port in North America. Processing more than 1.5 million containers annually, the Port is a model of intermodal efficiency. It is also an entrepot for goods being shipped from central Canada and the Great Lakes to Europe and Asia. The harbor handles more than 2,000 ship dockings annually from lines such as CSL, CMA-CGM, Hapag-Lloyd, Maersk, MSC and OOCL. Maritime port activity in Montreal supports some 18,280 jobs and provides $1.5 billion in economic benefits to the Canadian economy. It makes perfect sense for Canada’s Atlantic Gateway to be led by its largest, most successful and efficient port. Montreal possesses the intermodal and managerial expertise that the Atlantic Gateway needs. Not incidentally, Montreal also has political influence that dwarfs that of any other port in Atlantic Canada. And make no mistake – when it comes to shaping transportation policy in Canada, political influence and leverage matters. For all its success, Montreal does face challenges. Its 26 kilometers of riverfront property is increasingly valuable but constricted. Like any maritime urban center, Montreal has grown in tandem with, and around, its Port. As the city expanded, increasing geographic pressures were placed on the Port and the Port Authority responded with plans to expand operations on the south shore of the St Lawrence at Contrecoeur. Despite seasonal water depth variations in the winter, the Port is able to maintain service 12 months a year with the use of icebreakers. The depth and width of the St Lawrence Seaway is another challenge, but there are no plans to expand the Seaway, which was built more than a half-century ago. Meanwhile, shipping lines around the world are in search of economies of scale, improved efficiency and environmental performance. This has brought forward a wave of megaships, sometimes referred to as Triple E’s or Ultra Large Container Ships (ULCS’s). Four football fields long and a football field wide, these behemoths carry 14,000 to 20,000 containers. Over 140 of these ships are on order or already at sea, with more being launched every month. These vessels represent the future of container shipping. Most of these super-ships are too large for the newly expanded Panama Canal (which can accommodate ships carrying up to 12,500 containers). Those coming from Asia to the East Coast of North America usually transit through the Suez Canal, which is being deepened and expanded to double its current capacity. The Suez can accommodate all classes of ULCS’s. The St Lawrence Seaway, meanwhile, can only accommodate vessels carrying 4,000 to 6,000 containers. This effectively eliminates a role for the Port of Montreal in handling these megaships, which are central to the future of shipping. However, a solution can be found in the Port of Sydney, Nova Scotia. Sydney is located just two miles off the end of the Great Circle Route. Container ships coming from Europe, the Mediterranean and Suez can get to Sydney faster and cheaper than any other port on the east coast of North America. The Port has a functioning harbor deep enough to handle even the largest container ships. It operates marine ferry services (Marine Atlantic) to Newfoundland and already handles 90,000 containers a year. The Port has strong break-bulk operations and a very successful, expanding cruise terminal. McKeil Marine, the fastest growing marine services firm in Canada, has just selected Sydney for its Atlantic hub. Financing for a container terminal and logistics park is available and there are more institutions wanting to participate than there is room at the table. Construction giant Bechtel is now engaged in the necessary preliminary engineering work and will serve as prime contractor when the project moves forward. The Port and logistics park will operate within a Free Trade Zone which is serviced by double-stack rail that runs across the Maritimes and New England, all the way to Montreal and central Canada. Finally, all permitting and environmental approvals are in place and the project is shovel-ready. Montreal would play a significant role in the development of the Port of Sydney by lending its intermodal and port management expertise, its political influence, and its access to capital markets. Montreal and Quebec have deep historical ties to Cape Breton (Isle Royale as it was known in New France) where, in 1713, the French built the mightiest fort in North America, the Fortress of Louisbourg, as guardian of the St Lawrence and a link between the interior and the wider world. They established this fortress harbor precisely because of its strategic location as the first landfall coming from Europe or the Mediterranean. While efforts are being made to deepen harbors and raise bridges at ports like New York/New Jersey, Norfolk and Savannah, no East Coast port is ready to manage this new generation of super-ships. Ports in existing urban areas face the challenge of rising property values, finite storage capacity and transportation bottlenecks. Port and transportation congestion, on both the East and West Coasts of the U.S. are driving up costs and wreaking havoc with just-in-time inventory regimes. Shippers are becoming increasingly frustrated with the status quo. These realities have opened the doors to a major expansion of the already successful port of Prince Rupert, BC. In just 20 years, Prince Rupert has become a major west coast container port. Prince Rupert is a success today because the political will existed to foster public and private investment in the design and construction of the necessary infrastructure. Rather than harming Vancouver, the rise of Prince Rupert nudged Vancouver toward modernization which has made its port more successful than ever, largely due to the financial support of both the provincial and federal governments. There are lessons here for Maritime Canada. The solution for the East Coast is a new-build port specifically designed to handle ULCS’s. Sydney is the only east coast port that is planned along these lines. Resistance to coastal development and increasingly burdensome environmental regulations make the construction of a major new port along the East Coast of the United States very unlikely. Montreal, through its capital markets, its Port Authority operations experience, and its alliance with the H2O Consortium (representing the St Lawrence River and Great Lake ports and operators), has an opportunity to take a major equity position in this new east coast transshipment hub. Montreal can offer its financial strength and intermodal/maritime expertise to Atlantic Canada. Taking the lead in the development of Canada’s Atlantic Gateway would represent a bold break-out strategy for Montreal. It would enable Montreal to influence transshipment strategies and divert incremental traffic down the St Lawrence to Montreal and the Great Lakes, thereby reinforcing Montreal’s role as the dominant maritime entrepot in Canada. What could not be shipped by sea to Montreal and points south and west could be shipped by rail. At present, the Atlantic Gateway is more rhetoric than reality. Despite an expected doubling of Suez traffic to eastern North America over the next 10 years and increased traffic resulting from Canada’s new free trade agreement with Europe (CETA), Canada has yet to lay the foundation for a world-class trade corridor through the Maritimes, one that carries both imports and exports to and from Europe and Asia—in particular, manufactured exports from central Canada. Montreal will benefit from this increased traffic by virtue of existing shipping relationships and its strategic location at the mouth of the Great Lakes, regardless of the success or failure of the Atlantic Gateway. Montreal and its H2O partners are in a position to leverage their collective strength and experience to establish an east coast hub able to handle even the largest ULCS’s and divert traffic by sea and rail to Canada’s great entrepot, Montreal, and beyond to the Great Lakes and into the central United States. Not to seize this opportunity would represent an enormous loss for Montreal and the H2O consortium. Canadian transportation policy is at an inflection point. If nothing is done to breathe life into the Atlantic Gateway, the benefits of CETA and increased trade coming west through Suez over the coming decade will flow not to Canadian ports but instead to congested, overpriced ports in the United States. This would be a hard scenario to explain before the bar of history. The bottom line is that Montreal has the expertise and influence to make the Atlantic Gateway a coherent, functioning reality. This leadership role would be good for Montreal, good for Canada, good for the Maritimes, and especially good for national unity. Barry Sheehy of Harbour Port Development Partners stands in front of a business transportation map. He says the region needs to build infrastructure to make a container terminal development possible. SYDNEY — A consultant working with the Port of Sydney Development Corp. says recently completed feasibility studies show a container terminal is definitely a possibility for Sydney Harbour. During a community update Tuesday, Barry Sheehy of Harbour Port Development Partners said he will be travelling to China in about two weeks to present the results of the studies to shipping companies and international financiers in hopes of convincing them to back a container terminal project in Sydney. One of the world’s largest construction companies, Bechtel Corp., is already on board, and the others are looking good, he said. “I can’t guarantee I won’t disappoint you,” Sheehy told an audience of about 30 businesspeople and citizens at the Holiday Inn. “I can guarantee we’re going to break our arm to do this. I can guarantee we wouldn’t be putting our time and money in if we didn’t think we could pull it off. “But if you want a guarantee, before the puck has dropped, that we’re going to win four-zero; that’s not how it works. We’ve got a great chance of winning this game, but no guarantees we’re going to win it. Critics have said a container terminal project isn’t realistic for Sydney, because the key ingredients have been lacking. Sheehy said he has met with potential bankers and there is now plenty of relatively cheap capital available for infrastructure projects. And, he said, CN has indicated it will provide rail service if a shipping company agrees to locate a container terminal in Sydney Harbour. With recently increasing investments in the Suez Canal and Chinese trade routes, container traffic passing by the East Coast is expected to double in the next 15 years, said Sheehy. And spending at the port of Montreal means more capacity that Sydney is positioned to service. It would help in the pitch to shippers if there were a grassroots group to promote community support in Cape Breton, he said. International companies, especially in China, do their homework and read up on local stories and any negative publicity will raise a red flag. And Harbour Port Development, which is spending its own money to try to build a container terminal consortium, has not done a good job of communicating with the public, Sheehy said. It was important to maintain corporate confidence in the initial stages, but now the community needs to understand the risks involved and to have realistic expectations, he said. “Money will never go where it’s not welcome,” Sheehy said. “Our strategy has shifted. We have operated below the radar for a long period of time — I think for good reason. “It would help if the community would form some kind of a booster group for the port who could help us develop an outreach program, because I don’t think that we have done as good a job as we should have. 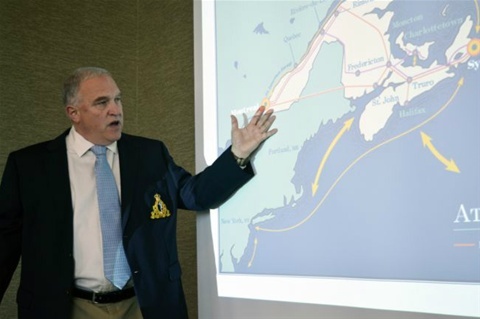 Barry Sheehy of Harbor Port Development Partners speaks during a briefing on progress made on the Sydney transshipment hub project at the Holiday Inn on Tuesday July 7, 2015. SYDNEY — The consultants tasked with drumming up business for the port of Sydney say they plan to leave July 19 for meetings with “high-level” executives with international shipping companies and investment firms in China. Barry Sheehy of Harbor Port Development Partners gave an hour briefing on some of the work that he, and business partner, Albert Barbusci, have undertaken since the Cape Breton Regional Municipality council confirmed last month a two-year deal where the men have exclusive rights to market Sydney as a commercial gateway to North America. Barbusci and Sheehy have already been working with the CBRM for 16 months, investing $1.2 million of their own capital into port development. Sheehy says his travels will take them to Beijing, Shanghai and Hong Kong. He wasn’t at liberty to say what companies they’ll be meeting with. However, he did say the process of securing deals with shippers is a long one, and notes there’s no guarantee port development will happen on a large scale. Although Sheehy says the project, so far, is moving ahead in a “very positive” way. He says finance partners his group has reached out to believe port development is feasible. “We found more than enough Canadian capital willing to fund the project,” Sheehy says. There have also been negotiations with logistics and warehousing companies that have been “fruitful” in showing interest in the port. Harbor Port Development Partners already has Bechtel on side conducting engineering studies. Bechtel is the world’s largest private sector construction firm and it has been doing preliminary work at the greenfield site near Sydport, and has been meeting with potential contractors. All of this work is meant to bring together a consortium of companies to build a container terminal operation in Sydney. “Then we had to reach out to operators,” Sheehy says. It meant seeking out services that could offer such things as bunkering, floating dry docks, tugboats, ship repair. And Sheehy says his group found that in McKeil Marine, a Hamilton, Ont.-based company, which plans to set up an operation in Sydport. “When we get floating dry docks here, we won’t be sending ferries to Boston to be serviced every two years. The marine services future for this harbour is very, very exciting all by itself but it was also fundamental for us to take the next steps forward,” says Sheehy. He says a robust marine services industry could become apparent in the harbour over the next 12 months. The process of building a container terminal will take much longer – an expected five-year window. A lot depends on the railway and ongoing talks with CN Rail, Sheehy says. Current operator, Genesee & Wyoming Inc., is preparing to abandon the line. Under rules set out by the Nova Scotia Utility and Review Board, the abandonment process cannot begin until October and won’t be completed until next spring. Rail infrastructure is the linchpin, says Sheehy, because it’s what every shipping company wants secured before making a deal. At present, Sheehy says a strategy is missing for the Atlantic Gateway. Investment in infrastructure is spent in phases over the long-term, which Sheehy expresses in a span of 80 to 100 years. He also expressed the need for the community to “rally” around the project, and possibly set up a committee to advocate its efforts to CBRM residents. Sheehy admits there hasn’t been much outreach to the public. He says outreach will become more important as business relationships are formed. “Money runs from trouble,” he says, meaning companies are wary to invest if there’s little public support for a project. Trade and transportation may seem like dull subjects but make no mistake – they determine how well we live and how much we pay for products. Poor countries have generally poor infrastructure and this includes inadequate transportation systems like road, rail, air and sea. Rich countries have efficient infrastructure in abundance. The contrast is stark. The quality of a country’s infrastructure, along with its education system, is probably the best gauge of a country’s standard of living. Wholesalers of soybeans pay a dollar more per bushel for Canadian soybeans than Brazilian beans. Why the price difference? The answer is transportation. Brazil’s transportation infrastructure is simply not as well developed as Canada’s. Six-mile-long traffic jams of trucks can be seen on any day waiting to load or unload products outside Brazilian ports. The long trek on inadequate roads resulting in delays, idling costs and spillage make the Brazilian products less attractive to the wholesaler who would rather pay a little extra for on time and undamaged deliveries. Even though the initial production costs of Brazilian soybeans are lower than that of their competitors in Canada, the lack of efficient infrastructure in Brazil and the resultant delays and spoilage neutralize Brazil’s initial cost advantage and the producer’s ability to compete. Thus, in the context of economics, we can see why adequate infrastructure is so important. This brings us to the Atlantic Gateway and why we should care about it. The Gateway was conceived almost a decade ago as a corridor for handling imports and exports from Europe and Asia. It made sense then and still does today. With the Comprehensive Economic and Trade Agreement (CETA) and the expansion of the Suez Canal, container traffic is set to boom. Traffic coming to (and from) the east coast of North America will double in the next 15 years. Already, 500,000 containers sail past Sydney every month on their way south to other ports, and in 10 years that number will nearly double. These ships reach Sydney first on the Great Circle Route and then sail right past us on their way to American ports like New York or Norfolk. The goal of the Atlantic Gateway should be to capture 10 per cent to15 per cent of this traffic – and it can be done. American ports are suffering chronic congestion and delays in moving containers inland from both the east and west coasts. These delays are cutting into American economic growth and aggravating both shippers and their customers who are, as a result, looking for alternatives. This represents an opportunity for Canadian ports on both coasts. With federal and provincial help, Prince Rupert is planning to double capacity and Vancouver has just completed a major expansion. Here on the east coast, Montreal, Halifax and Sydney are positioned to benefit as well – only if we get our act together. Sydney’s plans for a deep water transshipment hub, designed specifically to accommodate Triple E class ultra-large container ships, is critical to this strategy. These super-large ships represent the future of container shipping and no east coast port is really equipped to handle them. How big is the opportunity? In just 20 years, Prince Rupert has grown to where it presently sustains more than 2,000 jobs. Port related activity adds $290 million to the province’s GDP and $550 million to Canada’s economy. That’s big money. Sydney’s economic impact could be every bit as big. If, however, we are waiting for the federal government to act, we will wait a long time. In the 1990’s, under the pressure of unsustainable deficits, the Canadian government pretty much got out of the transportation business. They sold off airports, harbors, railways, airlines, etc. This privatization improved efficiency but it also left Ottawa with few tools for shaping transportation strategy, except writing checks. For example, $68 million was recently given to the port of Saint John. Halifax received a new $30 million runway. Sydney received $38 million for a vitally needed dredge. But where does all this fit into a larger Atlantic Gateway strategy? No one knows. And it’s not Ottawa but the Maritime provinces and Quebec that must answer this question. We must provide the leadership needed to breathe life into the Atlantic Gateway. Note that Quebec just announced its own $9 billion maritime strategy. The goal for the Atlantic Gateway is simple: capture 10 per cent to 15 per cent of the container traffic arriving from Europe and from Asia through Suez. To repeat – it can be done. All we have to do is make the necessary investments in maritime and rail infrastructure, free trade zones and regulatory reform. Prince Rupert shows it can be done. In building the Canadian Pacific Railway, John A. Macdonald understood he was doing more than building a railroad – he was building a nation. Barry Sheehy is co-owner of Harbour Port Development Partners, which has exclusive rights with CBRM to market Sydney as a commercial gateway to North America for two years. He lives in Gabarus.